Budgies prefer to do their own grooming. When it comes to staying clean, budgies are as self-sufficient as they can be. They preen and shake out dirt, but there is little else they can do to clean themselves in captivity. By giving your budgie a place to clean himself, you empower him to stay fresh. Fill a basin with lukewarm water. While tepid water probably isn't your first choice at bath time, it's ideal for a budgie. The basin should be shallow enough that your bird can stand in the water without being completely submerged, so try something like a big bowl or even a bathroom sink. Some birds even like to have the faucet running while they bathe, so you can experiment with that, too. You could turn a bowl upside down in the basin to give the bird an elevated place to stand. Take your bird to the edge of the water and allow him to jump in. Your budgie's instinct may be to just go for it, but he may need to think things over for a minute or two. Once he's in, he should splash around for a little bit, cleaning himself. Unlike with dogs or cats, you don't need soap or shampoo, and you don't have to do anything but let him take care of business. When he's done, he'll hop out and shake himself off -- make sure that the room isn't too cold for him. 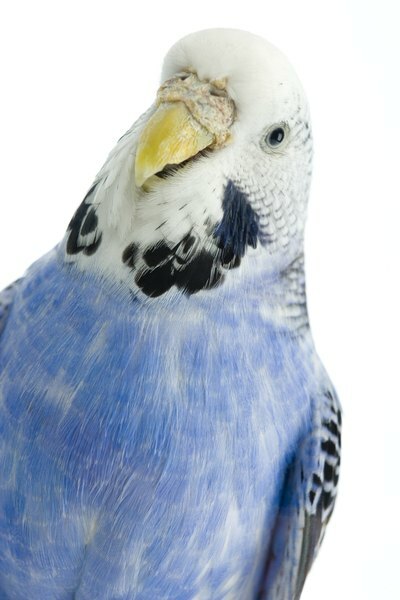 Give your budgie a light spray of lukewarm water if you don't have time for a full bath. This is especially important during winter months, when their skin can get dehydrated. A warm mist of water is usually welcome and helps him keep from drying out. Never spray your budgie with water as punishment. Budgies need to bathe regularly to stay clean and healthy, so teaching him that water is a punishment will confuse and frighten him. Many birds like a light spray on their bodies. Bathe your budgie in the morning so he can dry off throughout the day. Can Two Cats in the Same Household Pass the Same Cold Virus or Bacteria Back & Forth?